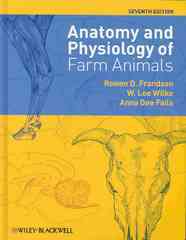 Anatomy and Physiology of Farm Animals 7 Edition The Seventh Edition of Anatomy and Physiology of Farm Animals is a thoroughly updated and revised version of this classic text. Drawing on current science and terminology with a number of new illustrations throughout and a new chapter on poultry, the book maintains its reputation for clarity, balanced scope, and breadth of content. The Seventh Edition provides veterinary, animal science, agriculture, and veterinary technician students with a comprehensive yet clear reference to understanding the fundamentals of anatomy and physiology.